On last night’s edition of BTR’s The Hagmann and Hagmann Report, just as the game show Jeopardy! had a category about the 9/11 Museum (Larry Silverstein’s insurance policy), was a major discussion about the ultimate flase flag attack which has killed off this republic. Joining the Hagmann’s was author and activist Rebekah Roth. She spent 30 years working as a flight attendant and an international purser for a major U.S. airline. Her career encompassed many major events involving airlines and aircraft, including hijackings and crashes. She also has been trained in emergency medical services. Here’s her story from the BTR page of the show, whose audio you can hear at this link. Having just returned from an international flight and fighting jet lag, Rebekah Roth was jarred awake on the morning of September 11, 2001 as the macabre sights in lower Manhattan splashed across her television. She could hardly believe what she was seeing as the twin towers of the World Trade Center turned to dust, ostensibly from the impact and fire caused by two direct hits by passenger planes hijacked by Muslim terrorists. At that moment, her job became much more perilous. During the remaining years she spent working within the airline industry, Rebekah Roth watched the transformation of commercial air travel, the birth of the TSA, and the implementation of security measures at airports and by the airlines as an insider. Her access to various reports issued by the FAA, her knowledge of the inner workings of the airlines, and the contacts she made during the course of her international travels would prove invaluable to the investigative journey she would undertake inside the matrix of the attacks of 9/11. In Methodical Illusion, Rebekah Roth adeptly transforms a fictional novel to an investigative summary, a tactic that is difficult at best for even the most skilled authors. She leaves readers with much information that has been ignored or deliberately scrubbed by the captured media. Courtesy of Conseravtive Tribune comes word of something many of us have often wondered about for years. And now it can be told…the Democratic Party really IS a tool of the Communists! That complaint should apply to neocons in the GOP like Boehner, McCain, Rubio, et al. Apparently Batchell has not met up with Libertarians and small government types like this writer. Perhaps Joe McCarthy had it right in going after communists. It now seems that Joseph McCarthy was far more accurate and more of a true patriot than we had been led to believe. As you can tell there is also a video of a two hour recording of Myron C. Fagan from 1967, wherein he talks about how the…wait for it…ILLUMINATI…helped out in promoting Communism. Just don’t tell that to the Los Angeles Times which ran an uncalled for hitpiece against Mark Dice. MEMO TO THE LA TIMES…JUST FOLD ILLUMINATI SUPPORTING SCUM! Comes reports of a bombshell to be dropped by a former commander-in-chief of the U.S. Pacific Fleet. The website Conservative Tribune reports why his former boss, President Obama, is about ready to hand over the fate of American citizens to so-called radical Islamists. Admiral James A. “Ace” Lyons, a 36-year Navy officer, wrote the column for Breitbart, which is beyond shocking and infuriating. Coming from a man who often reported directly to the White House and was responsible for a long list of victories, both diplomatic and physical, Lyons is about as credible as a source could ever hope to be. The big news over the past few weeks was Obama’s no-show for the massive march in solidarity that took place in Paris with forty other world leaders in attendance. Obama’s absence was nothing short of a message, albeit subtle, to the Islamic nation that as long as he’s king, they’re free to advance their radical agenda. Meanwhile, the most underreported story in the corporate media, done for deliberate reasons at the hands of corporations and the Pentagon (Operation Mockingbird) still rolls on in the alternative media. Afraid: Media Continues To Equate “Citizen” With “Natural Born Citizen”; Hillary Knows!? OR WAS IT BECAUSE OF THIS, WHICH KILLED ANDREW BREITBART…NAMELY THE CIA HEART ATTACK GUN? That’s the way to describe Joe Franklin, who died Saturday at age 88 in a New York hospice. A friend and producer told The Times it was due to prostate cancer. Like most people in TV in the 1950’s, Franklin began on radio, in the medium’s golden era, which this blogger is a fan of. He wrote for singer Kate Smith’s 1940s variety program, which featured Hollywood legends like Clark Gable, Myrna Loy and Edward G. Robinson. He also served as record picker (music director) for WNEW 1130’s iconic “Make-Believe Ballroom.” After that, host Martin Block arranged Franklin to go on the air with a program called “Vaudeville Isn’t Dead.” After stops at several other stations in the 1950s, Joe settled in at WOR in the mid-60s with his “Memory Lane” program — “that big late-night stroll for nostalgiacs and memorabiliacs,” as he described it. Of course along came TV and that’s when the legend really started to come in to play. His late-night television show, from 1950 to 1962 on WJZ (now WABC-TV) and then until 1993 on WOR-TV/WWOR, formed the core of his legend. He would record his shows mostly given their late night time spot, including even before sign-off on channel 9 at one point. Speaking of sign-off and sign-ons, the Times said for channel 7, at least in 1951, Joe’s midday program live was “the first regular program that Channel 7 had ever broadcast at noon.” And that was in the days even before “The View”, WAY BEFORE THEN. Word spread fast about this new concept in New York television, a talk show. [C]elebrities like Elvis Presley, Bing Crosby and John F. Kennedy were making their way to the dingy basement studio on West 67th Street — a room with hot lights that was “twice the size of a cab,” Mr. Franklin recalled in 2002. But the show that would make him legend was on channel 9. It was the most bizarre talk show in broadcast TV history. And not in a Povich/Springer/Cunningham, WIlkos way. But in a VERY good way. Here is one such show broken up into parts on Valentine’s Day 1976…a Saturday, which bizarrely enough is when this year’s lover’s day takes place. No script, no cue cards, no rehearsal. 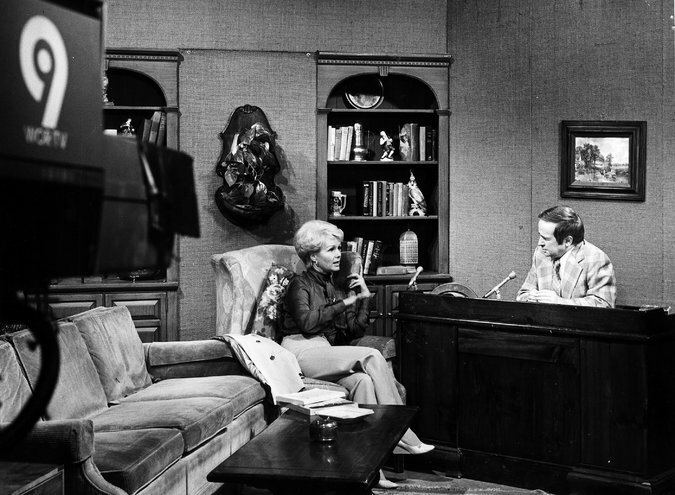 It seemed to fly by the seat of the pants, even though this episode was recorded for broadcast late at night before channel 9 would sign-off the air. In this clip, aired in the late 1980’s (note the WWOR-TV ID) as part of a best of series, Joe interviews one of his heros, none other than Bing Crosby. But somehow if you went to his office in Manhattan, you’d swear you had entered a reincarnation of Fibber McGee’s closet. AND THIS WAS IN THE DAYS BEFORE WE HAD HEARD ABOUT HOARDING! I don’t know if I was asked to clean it up if I would get the job done. But let me say this, whoever has to, I just may have to envy that job. Thankfully kicked out of office last year when he lost his primary and now a Wall Street Investment honcho…NOT TO MY SURPRISE…CRONY SCUM! Apparently it seems Catherine Herridge, the national security (what hypocrisy) reports for Fox News (of all places) has caught the US-Government backed and created terror boogeyman ISIS MAKING A FAKE TERROR PROPAGANDA VIDEO. NOTE WHAT CATHERINE HERRIDGE IS SAYING AS SHE SPEAKS TO BLONDE BIMBO ANCHORETTE MARTHA MCCALLUM. Amd yet videos put out by alternative media outlets and put on YouTube ARE REMOVED. That’s due to the Zionists running YouTube and Google and their connections to the corporate dinosaur media. Experts pouring over the videos believe they were made in an area south of Raqqa in northern Syria, the self-declared capital of the so-called Islamic State. The killings of the five other hostages took place between August and November. The U.S.-led coalition began targeting I-S militants in Syria in mid-September, and has gradually intensified its aerial bombardment of suspected IS infrastructure in both Syria and Iraq. So this nation has been CAUGHT faking propaganda videos. But you won’t hear abot it from the Pentagon Mockingbird News Services. California newspaper office vandalized over use of ‘illegal’ immigrant label…DON’T THESE SPICS KNOW ABOUT FREEDOM OF THE PRESS?! OH, I FORGOT THEY VOTE FOR OBAMA AND THE NEOCONS!